A Noel Guard, invented by Jim Noel, is used to deter raccoons and cats from preying on the contents of nestboxes. 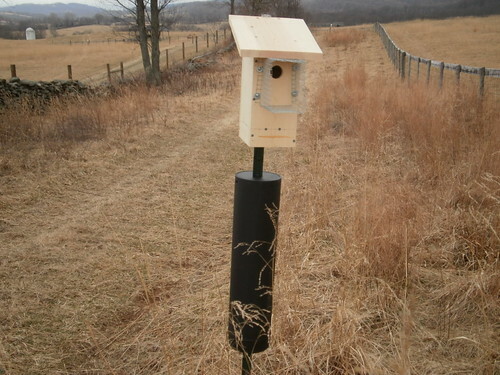 It is inexpensive and useful for boxes mounted on trees and wooden posts that offer easy access to climbing predators. Make sure it is deep enough and securely attached (it can be stapled on) so a raccoon can not pull it off or reach past it to eggs or nestlings. If bluebirds have a choice, they may select a box without a Noel Guard. Other monitors who leave them up year round have not had issues with acceptance, and find that bluebirds, chickadees and House Wrens are not deterred. Consider putting up a Noel Guard after the first egg is laid to avoid scaring the birds away, although some folks have success leaving them up year round. Note the Erva raccoon baffle on the pole to prevent scavengers from destroying the nests.